Libelium presents a new cloud connectivity service: the Bridge. This new service is framed on Libelium’s strategy to offer higher value-added services to the entire chain of IoT key players. 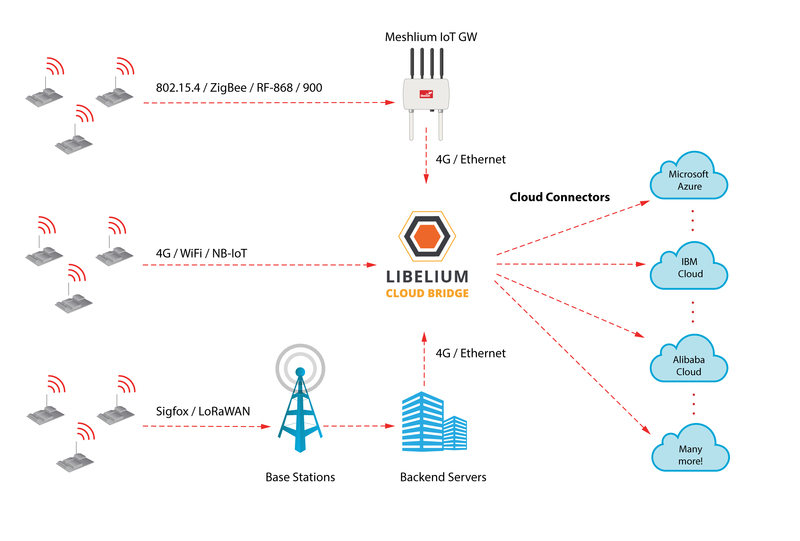 Libelium Cloud Bridge allows users to send information from any IoT device to the main worldwide cloud platforms simultaneously and without having to implement each specific cloud protocol or authentication methodology, including Alibaba Cloud, Amazon Web Services, Cumulocity, IBM Bluemix, Microsoft Azure, MQTT, SAP by Techedge and Telefonica. Due to the importance that device connectivity and improved cloud services represent for the growth of the IoT market, the new Bridge service allows devices to have direct, secure and reliable connectivity to the cloud, guaranteeing end-to-end data privacy. David Gascón, Libelium CTO, highlights the greater connectivity, enhanced data security and online device control that the Bridge provides to speed up the IoT adoption. “IoT projects can benefit now from being compatible with any cloud platform just supporting one HTTPS call and even more, all the messages are point-to-point encrypted so developers do not have to cope with security issues,” states Gascón. By simply using a unique HTTPS request, any device using NB-IoT, 4G or WiFi can be connected to the main worldwide cloud platforms without having to support their own specific connectivity protocols just by sending the data to a unique Internet server: “the Bridge”. The system is even compatible with other wireless protocols that do not support HTTP calls such as LoRaWAN, ZigBee, or Sigfox. A middleware may be installed in gateways, base stations and servers to connect these LPWAN networks with the Bridge. Security is a key factor in the Bridge. The nodes implement double encryption methodology. One between the node and the Bridge and the second one between the node and the final cloud. This way, the information remains encrypted during the entire transfer and can only be read on its final destination. An online Demo of the Bridge can be found in the Libelium website. Users can subscribe to “Libelium Cloud Bridge” on The IoT Marketplace through an annual freemium license. By accessing Libelium Services Cloud Manager users activate the license, choose the different Plug&Sense! nodes to be connected, select the cloud to send the data, schedule data delivery from the Programming Cloud Service or even manage different projects for the same cloud. In 2017 Libelium began growing its solutions portfolio with software services to give intelligence to its sensor devices such as the Programming Cloud Service that allows IoT devices programming from the Cloud in just minutes without code writing experience. For technical details on Libelium Cloud Bridge: Libelium Cloud Bridge Technical Guide.